In the two-short years since BØRNS released his debut album, 2015’s Dopamine, the pop singer and songwriter’s career has been like lightning in a bottle, with scores of fans falling in love with the singer’s electric music and persona. After touring around the world, and a brief hiatus to work on new songs, BØRNS is once again center-stage as he prepares to release his upcoming sophomore record, slated for release in early 2018. Earlier this summer, fans got a first taste of the new record with the release of BØRNS’ lead single, “Faded Heart.” It’s an ebullient track that has the singer searching the stars for answers to his destiny. “Don’t you break my faded heart” entreats BØRNS, in what seems like a plea from the singer to never become jaded or lose his passion for his art, life, and love. After completing his first major tour with Dopamine, BØRNS says he discovered and learned a lot from life on the road, why people go to shows, and the power he felt on stage. Then one morning he woke up, back home, washing the dishes, and feeling acutely aware of his humanity. “It’s like this snap of reality in a way, and so ‘Faded Heart’ is my dealing with my life and morality” BØRNS told Billboard. This time around, BØRNS spent a lot of time digging into the music from decades past, and comparing it to today’s landscape. 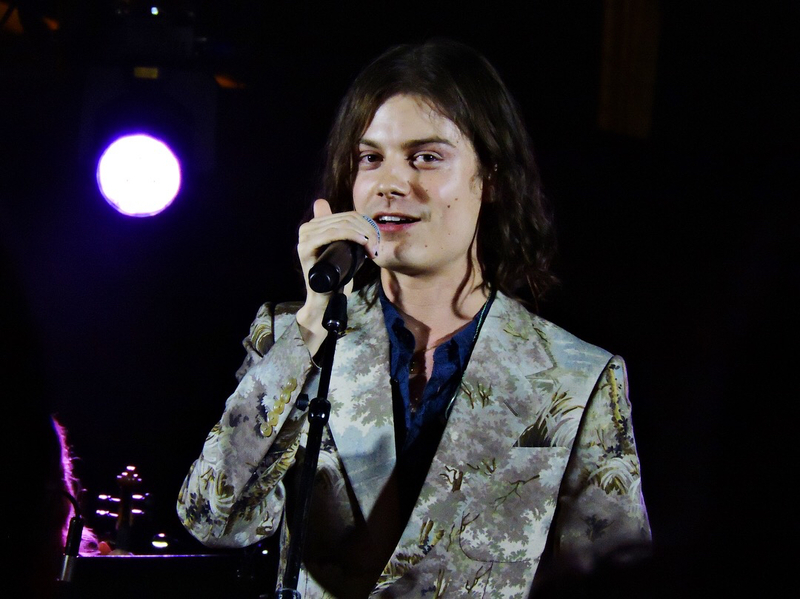 BØRNS noticed many “missing sounds” that have disappeared from contemporary pop music, which he sought to revive on the new record. These realizations give some insight into why BØRNS can be found playing a series of small shows ahead of his sophomore release. He wants the experience to feel special for the fans and for himself as an artist. For this particular occasion, BØRNS performed under the Viaduct of LA State Historic Park with a literal symphony of sounds, beautifully helmed by the American Youth Symphony (AYS). After playing their last song, without hardly any pause, BØRNS swiftly appeared on stage ready to begin his set. The singer opened with “American Money,” followed by “Past Lives” as he breezed through most of the songs on Dopamine. “This is the coolest thing I’ve ever done” remarked the singer. It was clear he was having fun on stage with the orchestra, with the city, and with the small crowd of 500 fans in attendance. He routinely interacted with the crowd, responding to their questions (“Who are you wearing?” “Gucci”), and declarations (“We love you!” “That’s very nice, I love you guys too, thank you for being here.”), interlocking hands with the front row, and even singing into someone’s phone. As things neared the end BØRNS announced to the audience that he had one song left before giving into a crowd that clearly wanted more. “Well, maybe two” he grinned as everyone screamed gleefully. BØRNS naturally closed out the set with his biggest smash and the song that started it all, “Electric Love.” Everyone joined him in singing, as the lights flashed and, as is customary at the symphony, BØRNS was gifted a bouquet of roses. He bid the room adieu and as the crowd dispersed we were left once again with the sounds of Los Angeles. The excited chattering of departing guests, car engines running, and neon lights flickering. It was a truly enchanting evening, one that won’t fade into a distant memory anytime soon.